Hispanic influence is everywhere. 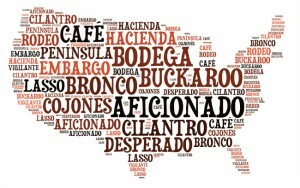 One way to see that influence is in the many common English words derived from Spanish that we use routinely without reflecting on their origins. Let’s take a look at them! 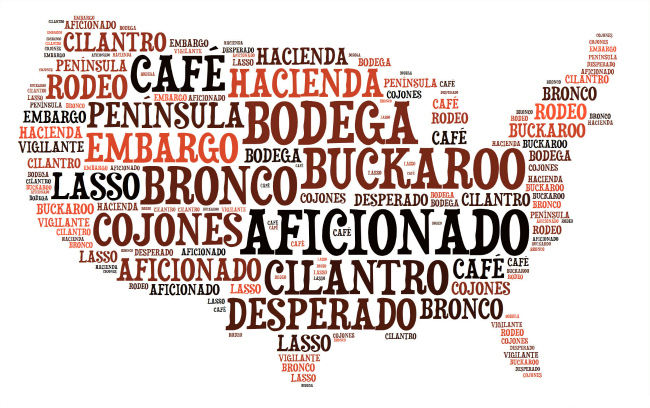 Many Spanish words have been adopted by English from three primary sources: 1) Many words entered American English in the days of Mexican and/or Spanish cowboys working in what is now the U.S. Southwest. 2) Words of Caribbean origin entered English by way of trade. 3) The names of foods whose names have no English equivalent, as the intermingling of cultures has expanded our diets as well as our vocabulary. Many of our Spanish students often use these words without knowing that they come from Spanish, so when one of our Spanish teachers explains to them their origin they get really surprised. Banana: originally of African origin, this word entered English via either Spanish or Portuguese. Barbecue: from barbacoa, a word of Caribbean origin. Bodega: if you live in New York, you probably use this word to describe what the rest of the country calls a “corner store” (tienda de comestibles de barrio). Bravo: from either Italian or Old Spanish. Burrito: literally means “little donkey”. California: the name is first mentioned in the Spanish romance “Exploits of Espladán” (written by Garci Ordóñez de Montalvo in 1510). This book was influential among the early Spanish explorers, who first used the name California to describe the North American territory. Cojones: this powerful and sometimes rude Spanish word is used in English in the sense of value or courage. Interestingly this word is particularly popular in the American political world. Desperado: this word was the name given to these audacious criminals who proliferated greatly during the early years of the American Wild West. Its true origin is in the Spanish word desesperado which means desperate. Embargo: means the same thing in Spanish. Florida: means “land full of flowers” in Spanish. Hurricane: from huracán, originally an indigenous Caribbean word. Mosquito: means the same thing in Spanish. Nevada: means “snow-capped peak,” so you can see how the state wound up with that name. Patio: in Spanish, this word most often refers to a courtyard. Plaza: means the same thing in Spanish. Rodeo: same word in Spanish, just pronounced different. It comes from the verb “rodear” (to encircle), a term used to describe driving cattle. Tomato: from tomate, derived from Nahuatl tomatl.